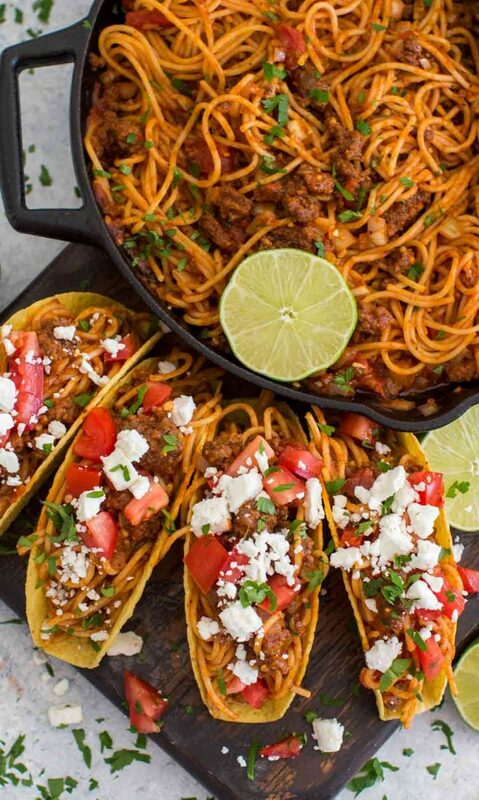 Spaghetti Tacos are messy, fun and extra delicious. Cooked in a rich beef and tomato sauce and served in crispy taco shells with your favorite toppings. 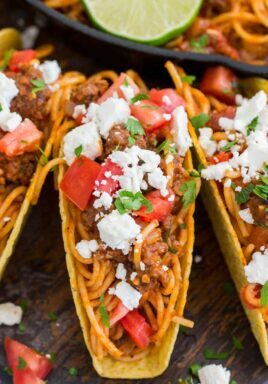 Spaghetti Tacos are one of the most fun and delicious meals, and definitely one of my favorites. 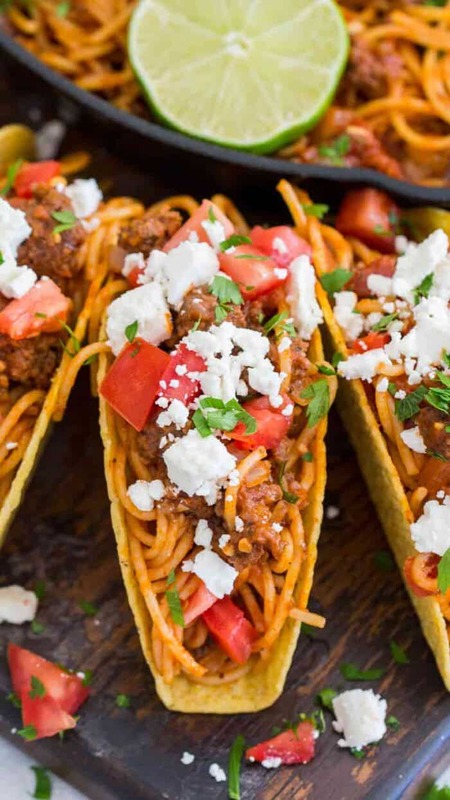 If you want to spice up things and turn a regular pasta dinner into something special and fun, then Spaghetti Tacos is your go-to recipe. Such an easy dinner, a super crowd pleaser and a cool recipe for a party! 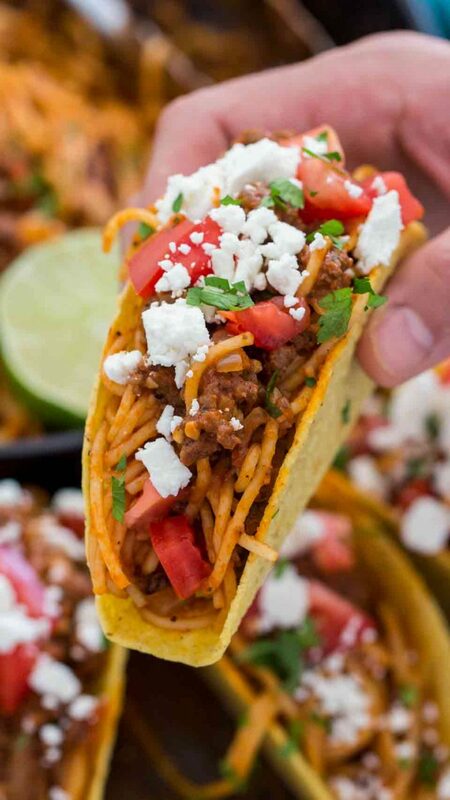 There is something so tasty about serving spaghetti into crispy taco shells. They are definitely messy, but totally worth the tomato sauce mustache! The best part, in my opinion, is that you can serve them with your favorite toppings. 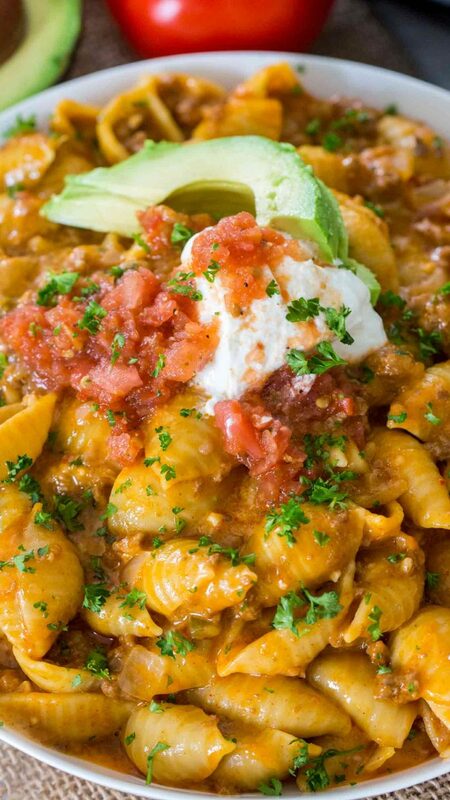 I like adding Cotija cheese, fresh parsley, tomatoes and creamy avocado! Now you don’t have to decide whether to have spaghetti or tacos, you can have the best of both worlds! Spaghetti tacos are not something fancy or hard to make. Just your favorite spaghetti recipe served in either soft or crispy taco shells. 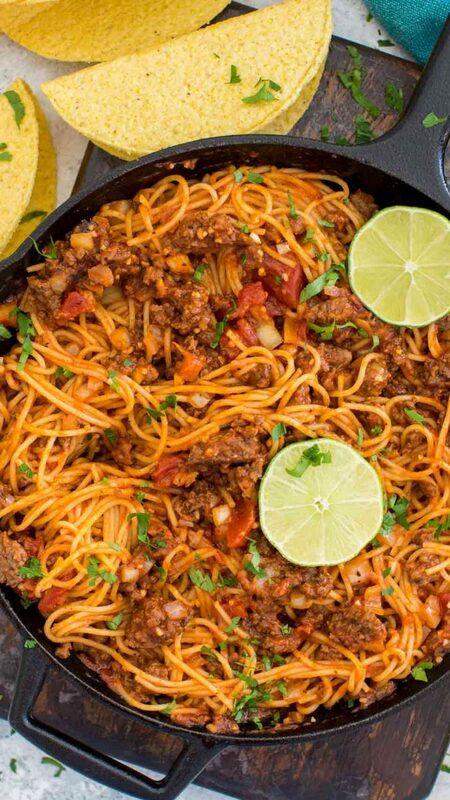 What do you need to make Spaghetti Tacos? 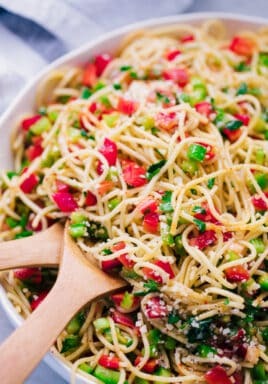 Pasta: you can use spaghetti, angel hair or fettuccine noodles. You can also use gluten-free pasta or whole wheat. Pasta sauce or marinara sauce: you can use store-bought pasta sauce or homemade. I usually like to buy quality pasta sauce, that also has some added flavor, like garlic or basil. Beef: grass-fed and organic are best. 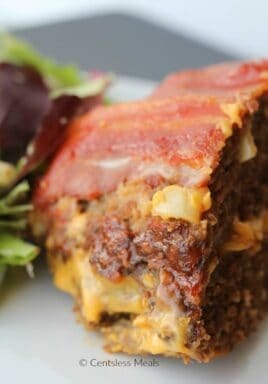 This recipe can also be made with chicken or turkey ground meat. Taco Shells: I like to use the crispy taco shells, it’s easier to scoop the spaghetti into them. But you can use soft taco tortillas as well. Taco Seasoning: to get the delicious taco flavor. Favorite Toppings: your favorite taco toppings to add extra flavor. How do you make Spaghetti Tacos? 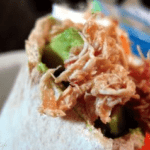 The recipe is really easy and it involves very simple steps. It is perfect for a weeknight meal, yet fun enough to serve for a party. First, you start with cooking and crumbling the beef. I prefer to leave some larger crumbs, as they will hold better in the taco shells. You add the rest of the ingredients to the beef, season it and add the pasta sauce. In the meantime, you cook the pasta, and once done, add it to the beef sauce. Fill the taco shells with the spaghetti and serve with your favorite toppings. How to make Vegan or Vegetarian Spaghetti Tacos? 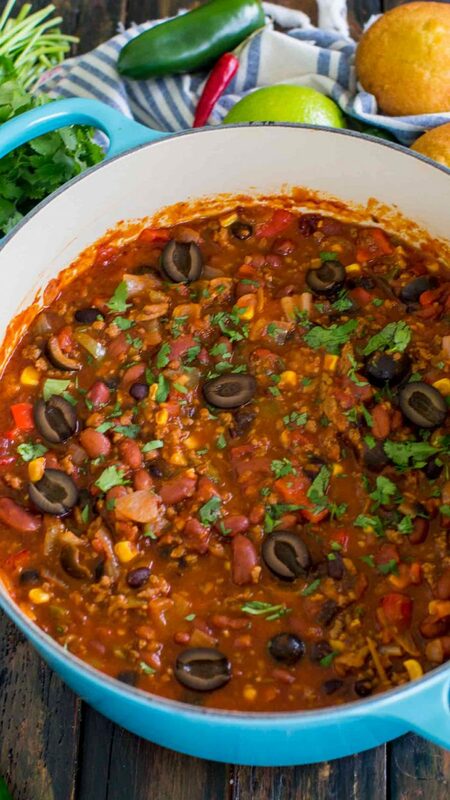 Use your favorite pasta sauce that is either vegan or vegetarian and replace the meat with either beans or tofu. Cheese: either Cotija cheese, Mozzarella cheese, Mexican blend cheese, cheddar cheese or feta cheese. Prepare spaghetti noodles according to package directions. Drain, return to pot and drizzle with one tablespoon of olive oil. Toss so they don't stick one to each other. In the meantime, place a large skillet or cast iron pan over medium-high heat and add 2 tablespoons of olive oil. Once the oil is hot and meat, and do not move it for 1 minute, to get a nice sear on it. Start crumbling the meat, using a wooden spoon and cook the meat until nicely browned and no longer pink. Drain excess fat if needed. Add chopped onion, minced garlic, tomato paste, salt, pepper and taco seasoning. Stir to combine and cook for about 2 minutes, until onion is soft. Add spaghetti sauce and cook until warmed. Add beef sauce to spaghetti noodles or add the noodles to the skillet if the skillet is large enough, mix thoroughly. To assemble the tacos, fill the shells with spaghetti and garnish with desired toppings. Serve immediately.